Nowadays, maids are basically a moe stereotype. Otaku characters like Sakurasou no Petto na Kanojou's Ryuunosuke Akasaka, Lucky Star's Konata Izumi, and the Genshiken gang all love maids. 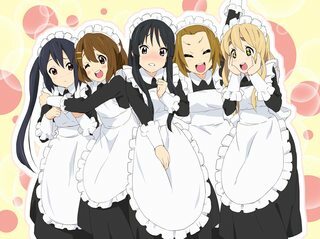 Even K-On's Sawako Yamanaka, who isn't an otaku, puts the Light Music Club girls in maid outfits. For a while, every single show that came out had a maid character, and several shows focused wholly or in part on maids, who may or may not also be androids (e.g. 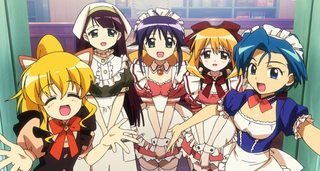 Hanaukyou Maid Tai, Hand Maid May, He is My Master, Koharu Biyori, Mahoromatic). It was shockingly difficult to find a SFW picture from Koharu Biyori. 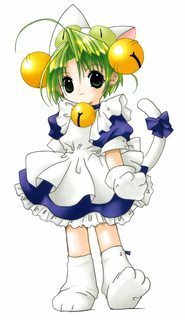 Even shows that didn't have maids were affected: Digi Carat's Dejiko wore a costume which looked rather like a maid outfit, even though she was not a maid, but rather a clerk in an anime store (and actually an alien princess). My perception was that this all started sometime around 2001, but I never saw how; it just seemed like one day I was surrounded by maids. (Not that it bothered me to be surrounded by maids.) How did this get started? Was there a single show or a few shows that started the maid craze? Or was it always there, and I just never noticed? It's worth reading the full paper as it's quite interesting. A game that specifically had maid cafés in it was Welcome to Pia Carrot!! and is usually tied to the start of this trend. Furthermore, the first maid café to be set up was in 1998 , as a special event for the game. Why is the Tiger/German Suplex wrestling move so popular among anime culture? Why is the mikan so popular in anime and manga? Why are llamas/alpacas so popular in anime?